Space shuttle Endeavour atop the crawler transporter nears Launch Pad 39A at NASA's Kennedy Space Center in Florida on Jan. 6, 2010 to prepare for a Feb. 7 launch. CAPE CANAVERAL, Fla. - With the launch of space shuttleEndeavour just two days away, NASA workers are staying focused despite being inshock from the cancellation of the agency?s moon program earlier this week. Endeavour is set to blast off early Sunday morning from aseaside pad here at NASA?s Kennedy Space Center at 4:39 a.m. EST (0939 GMT). Itis the first of NASA?s five finalshuttle missions and comes less than a week after Monday?s announcementthat the space agency is canceling the program responsible for replacing theaging orbiter fleet. ?There?re a few folks that are kind of reeling from theshock,? said Mike Moses, NASA?s shuttle integration manager, in a Fridaybriefing. On Monday, President Barack Obama rolled out the 2011 budgetrequest for NASA as part of the nation?s larger budget. The request would scrapNASA?s current Constellation program, which has been building the Orionspacecraft and Ares rockets slated to replace the shuttle fleet, and set aside$6 billion over five years to support the development of commercial spaceshipscapable of launching astronauts into space. NASA has spent five years and $9 billion working on theConstellation program, so the moonprogram?s elimination came as a surprise for many within the space agency. But, Moses stressed, the team is working hard to focus todayon launchingEndeavour and its crew of six astronauts safely to the International SpaceStation (ISS). The shuttle is flying a 13-day mission to deliver a new room andobservation portal to the space station. ?I don?t spend a lot of time thinking about the futurebecause if we can?t do what we?re doing today, or on Sunday, right, then therereally is no future for any of the spaceflight programs or the ISS,? Mosessaid. ?So we?ve got to get this flight done. ? NASA launch director Mike Leinbach described the feeling ofsome shuttle workers as one of ?angst? over the coming retirement of theagency?s three orbiters; Endeavour, Discovery and Atlantis.? 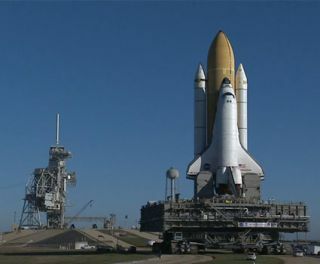 They have knownfor years that the spaceshuttles will be retired at the end of 2010 to make way for theirreplacements, but now there is new uncertainty.? ?Distractions are there. Shock is there, uncertainty,?Leinbach said of his personal feelings. But when it comes time to launch astronauts and shuttles,Leinbach said the focus is sharp and unwavering. ?I asked everybody to treat these last five missions like aprofessional team, we can be down in the fourth quarter,? Leinbach said. ?Wecan be many, many points behind, but we?re going to play every down and we?regoing until the final whistle blows.? The sports metaphor is especially appropriate for Endeavour?supcoming launch. After all, the shuttle is launching on Super Bowl Sunday. ?It?s a case where we?re going to play this game to the veryend,? Leinbach said. ?It?s the only way we can play it.? NASA's Final Night Shuttle Launch Visible From Eastern U.S.
SPACE.com is providing complete coverage of Endeavour'sSTS-130 mission to the International Space Station with Managing Editor TariqMalik in Cape Canaveral and Staff Writer Clara Moskowitz in New York. Click here for shuttlemission updates and a link to NASA TV.